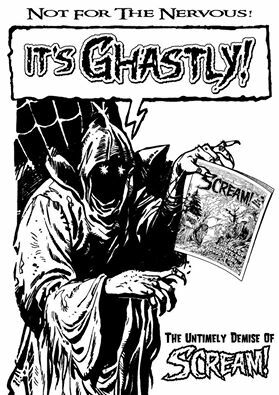 I have just received a copy of “It’s Ghastly” – Hibernia Comics’ latest addition to their Comic Archive. This 64-page publication spells out the reasons for the demise of IPC’s short-lived horror title Scream! and exhumes lost material intended for the abandoned weekly issues. It’s a handsome glossy publication, mostly in black and white but with a handful of colour pages in the middle. My particular interest wasn’t so much in the information about Scream! itself (as I never read that title) as about what it might reveal about comics publishing of the time, or any as-yet-unknown information about who did what. It features a lot of interviews and information from people involved in creating the title: Barrie Tomlinson (Group Editor at the time), Gil Page (Managing Editor of the title), Ian Rimmer (editor), Simon Furman (sub-editor). Some of them are reprints of interviews originally published some years previously, but bringing them together in one magazine is a definite service to fans of the title and those interested in this slice of history. I was interested to note how the various memories of what happened at that time were all slightly different: David McDonald was clearly trying to get an answer to the key question of why Scream! folded so quickly. Barrie Tomlinson had a number of possible answers – the strike, the content, the sales figures… while Gil Page put the blame fairly squarely on the overall sales figures. Ian Rimmer puts it down to a staffing problem and to management interference and second-guessing, which put a real crimp in the process of just getting on with creating as good a title as possible. He ultimately blames management timidity. So even from people who were there at the time, it’s possible to get as many answers as there are people answering – at least for the tricky questions. Something for any of us interviewers or comics historians to be aware of in terms of the dangers of drawing firm conclusions! As with MacManus’ “The Mighty One”, I was struck once again by the sheer amount of writing that was done in house. There is also a lot of interesting discussion about artwork: not so much the process of creating it or how much was done by the art editor, but about how it was reused in subsequent publications, even if that meant cutting up a page of art or reusing some cover artwork by José Casanovas in a Holiday Special – but removing the central human character which was part of the whole point of the original story. There’s lots of solid material in here – interviews, re-creations of three unused covers that could have been printed in issues 16, 17, and 18 (the title stopped at 15), scripts, and a whole unpublished story of “The Nightcomers”! The artwork is the original from the time, but as it was unlettered and only half the script could be found, the other half was rescripted by Simon Furman, who was the original writer. Those of us who are fans of other titles can only feel a mixture of jealousy that David was able to come across this treasure trove, and hopefulness that maybe such a miracle could happen to our own favourite title some day.